Earlier this year, it was revealed that Kidrobot would be creating a series of toys based on the classic Mega Man series. Kidrobot is primarily a toy making company that specializes in mini figures and key-chains of popular characters from franchises like Marvel, DC Comics and Simpsons, which they are doing with Mega Man as well, along with a 7-inch line. 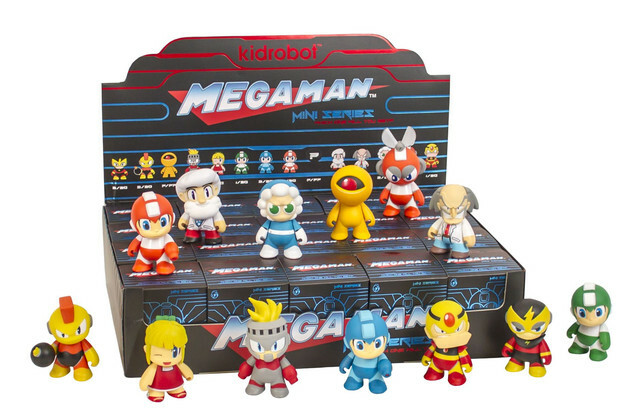 The mini-figures and key chains are both based off the original Mega Man, featuring the six robot masters – Cut Man, Guts Man, Elec Man, Ice Man, Bomb Man and Fire Man – Mega Man and two color variants (along with a mystery variant), Yellow Devil, Dr. Light, Dr. Wily and Roll. The mini-figures are 3 inches tall, while the key-chains seem to be 1 inch tall; in addition, they will be available for purchase in a blind box format. For the 7-inch line, so far we have Mega Man, Proto Man, and Break Man, Proto Man’s disguised form. Both the Mega Man mini-figures, and key chains are set to come out sometime this month. You can order them on Kidrobot’s website. Be aware that due to the blind box nature, you won’t know what you’re getting till you open the box. The 7-inch Mega Man, Proto Man, and Break Man have no set release date, or price yet. The mini-figures are $11.99 each, with a 5-pack available for $59.99. The key-chains are $6.